There have been no less than a half a dozen Shark Tank products devoted to Dogs, but the Turbo Pup Energy Bar's in a class of its own when it comes to the pet food industry. We've seen Dog Biscuits, Dog Food, Dog Accessories and even a traveling Dog Food Bowl that looks convenient but was not a practical Shark Tank Investment. The one thing all the Dog related products have in common compared to the Turbo Pup Energy Bars, is the competition. Have you ever heard of an energy meal bar for dogs before? As a matter of fact, I'm willing to bet that Turbo Pup is the only Energy Bar on the market devoted specifically for Dogs of all ages. The idea to invent an energy bar for Dogs came from a Former Air Force Pilot by the name of Kristina Guerrero, who will be representing Turbo Pup on the next Episode of the Shark Tank this Friday night January 16, 2015. Kristina was on a long hike with her Husband and Dog near Portland, Oregon, when deciding to take a break. Like most hiker's in the Great Outdoors, the Guerrero's came prepared with Energy Bars for themselves, but the poor puppy could only stare and wonder why they didn't also think of him? A condensed highly nutritious meal for a dog in the form of an energy bar? Now that's an idea that could make it all the way to the Shark Tank Show and possibly get a very lucrative deal. Maybe it's good timing, but the website to buy Turbo Pup Bars was just updated while doing research for this article. It's actually a very good thing because Turbo Pup now has a "Shark Tank Special" compared to what I was finding on Amazon. You can buy only one type of energy bar on Amazon for only $3.99 per bar, but the shipping is $8.00 coming from a third party. You'll get a much better deal ordering Turbo Pup Energy Bars directly from the website especially if you take advantage of the "Shark Tank Special" including a dozen energy bars and a bonus treat for your Best Friend. The idea for an energy bar for dogs could easily grow into a multi-million dollar market in a very short amount of time. The Turbo Pup Business is clearly first to the market that millions of Dog Owners will at least try, but along with success, will also come competition. Considering the Turbo-Pup Energy Meals are the first to market, along with an appearance on the Shark Tank in Episode 619 this Friday night, the future looks bright for this new lightweight dog food on the go. 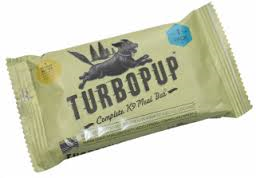 We just saw the show about Turbo Pup and it looks like a great product. While I'm not what you'd call an outdoors woman, I do take my dog with me when I travel. If I'm on an airplane and it runs late, I have no way to feed him. If you sold these in airport stores, I bet you'd get some pet owners who are in the same boat who need an emergency meal for their pets. Just a suggestion. Good luck with your product! Great product for working dogs in all fields - personal assistants, police, fire, farm/cattle, military, service. These dogs work very hard all day long and need portable nutritious meals. Congratulations on the deal. Best of Luck! I wish I had these meals when my husband and 3 dogs moved cross country in 5 days. It was such a pain to feed them while riding in the car. We drove for 12 hours a day and wanted to keep them on their schedules. Plus the space a big bag of dog food took up and the mess when the bag ripped being shoved in and out of the car. Great product idea! Can't wait for our pup to try this. The convenience is unparalleled as I have seen nothing like this at Petco, Whole Foods etc. We travel often with our pup and will make it much easier to do so! Another reviewer mentioned getting it in the airports, YES! Huge idea! Go Turbo Pup go! Also would like to Thank you for your service to our country!